 Jan David Winitz and Nancy Brinkley of Claremont Rug Company. 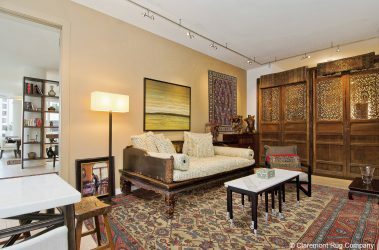 Art connoisseurs strategically utilize both floors and walls to display their antique rug collection. 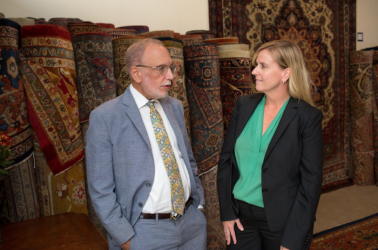 Sitting down to discuss art-caliber, Oriental rugs with Jan David Winitz – founder and president of Claremont Rug Company and Nancy Brinkley- Claremont’s Senior Sales Associate, is bound to be a conversation rife with surprises. Listening to the duo wax about the creative, personal and innovative applications clients have imagined to best showcase their treasures is fascinating. Far from being limited to use as traditional adornments in entryways and living spaces, today’s rare rug aficionado has rather effectively cast off any boundaries — real or imagined – when it comes to displaying their collections. 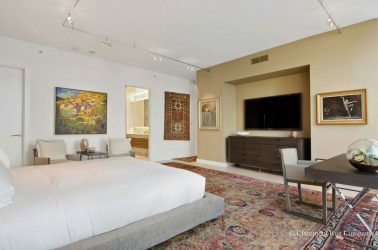 Modern master bedroom features a painting and an antique Caucasian Lesghi rug on the long wall and mid 19th century Sultanabad carpet on the floor. “We have seen applications that use rugs in incredibly different, unique ways,” says Brinkley, “And of those applications, wall displays are by and large the most illustrative example.” She should know. Brinkley has spent the past twenty-one years of her career working with Claremont clients to not only help them amass their collections but to assist them in developing seemingly endless ways to display the stunning beauties as well. While using rugs in imaginative ways including over furniture and banisters and under glass table tops is a relatively new design style, it is well rooted in classical composition – so much so that it can hardly be called a ‘trend’ — and both Brinkley and Winitz have seen an increase in acquiring rugs chosen for just such striking display. 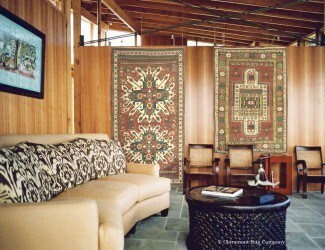 Cutting edge architecture displays two connoisseur level antique Caucasian tribal rugs. “We already know that a fine, 19th century rug can serve to exemplify and highlight the architecture and aesthetic of a home. And when you take a piece carefully chosen for a home, and display that piece in an untraditional way, the technique can give both the home and the rug exponentially elevated feelings of grandeur. It’s a dramatic aesthetic” explains Winitz. Dramatic indeed, as the stately home of one Claremont client clearly attests. Wanting to provide a layer of interest and a suggestion of warmth to two, mammoth stone hearths each soaring twenty feet high, the homeowners opted to hang a rare mid 19th century rug on either face. The resulting effect is an unforgettable juxtaposition that underscores not only the scale and grandeur of the home and the rugs, but seems to pay homage to history as well – by subtly reminding the viewer that once upon a time the rugs were woven for equally grand abodes. And when used with sculpture, painting and works of other art, the rugs speak not only to their own beauty but also to the beauty of a strong, overall design. Modern sitting room of art and antiques connoisseur with antique Caucasian rug over cabinet and two more rolled over carved doors waiting to be unfuried. “Rugs used in this manner eloquently express the character of the home,” says Winitz, “and in doing so, the rugs also express the character and personal style of the collectors themselves.” The delicious aesthetic of wall hung rugs is not reserved only for the grandly scaled, however. Small format or ‘mat’ sized rugs are huge on appeal despite being diminutive in stature. “When hung as one would a collection of beautiful paintings, a collection of smaller rugs is a spectacular design feature,” Brinkley extolls. Antique Qashqai Kashkuli rug hanging in passageway and a series of tribal rugs throughout the hallways. To transform the rugs from their originally intended purpose into hanging works of art, Claremont primarily utilizes two methods. In the first, loops are professionally sewn into the back of the rug to hold wooden or bronze dowels — permitting the rug to hang freely without the risk of damage or distortion. And in the second, the rug is stretched and mounted – much like a fine painting on canvas would be. 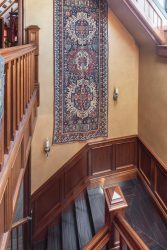 Dramatic stairwell presentation of antique Caucasian Zejwa Kuba Rug. The unorthodox mounting is just one way to give collectors the ability to use the rugs the way they desire, not just the way the weaver may have originally intended some several hundred years ago. As you may have already guessed, there are no ‘rules’ for how one must display and enjoy these precious rugs — though small patterns and more delicate designed pieces often lend themselves incredibly well to hanging in more intimate areas and enclosed spaces and those with large scale, prominent motifs work extraordinarily well hung where they can be admired and appreciated from afar. In either case, viewing the exquisite artistry of the rug’s design from a standing vantage point allows one to appreciate details that may otherwise be lost underfoot.